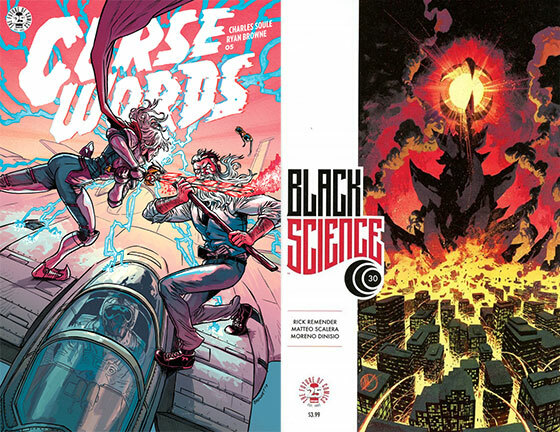 With issue five of Curse Words we get the finale of the first arc that includes plenty of insane wizard magic and a surprising plot reveal that will surely be a big part of the next volume. On a pure entertainment level Charles Soule has delivered. When your book includes a sentient Eiffel Tower boxing a magical wizard from another dimension how could you not enjoy this issue? Where Curse Words could look to improve is on the character end of the spectrum. In this issue Ruby Stitch and Wizord finally have their showdown that has been building since the first issue. I do wonder if it came an issue or two too soon. We are still finding out a lot about these two characters and if it as held back further it could have made their first confrontation either stronger and better legitimize some of the choices Ruby Stitch makes. Overall as a first volume, Soule and Ryan Browne has something potentially special on their hands. I do worry we will end up with an episodic narrative where we just get this continuous array of different evil wizards for Wizord to do battle with. Even so, it seems the key to making this work is the idea of trying to find magic in a more realistic world. Although this series may not be in the top echelon of what Image is currently producing it does have a lot of potential to be something great. At this time I am finally confident in making the bold that statement that the best Rick Remender book currently out is the last one I read. Since currently, that is Black Science it gets the reward. What aids that theory is the quality of this issue. Remender and Matteo Scalera are unhinged in the best of ways as they off characters in ways that are both hilarious and disturbing. Some may argue having a gigantic purple fluffy creature with a potty mouth kill a number of key characters is a little juvenile. I would not argue against that point except to say that sometimes juvenile is the right choice. With the clock ticking to the end of the world the action here is non-stop. If anything slightly tapping the breaks could have made this even better. There were some major developments, like a massive amount of surprise characters suddenly showing up, that were breezed by with little impact. Obviously, that will be dealt with in the next issues but it was odd to see something so major be forgotten about so quickly. This last arc also demonstrated just how massive this cast of characters has become. After the last arc that had a more limited cast you can forget just how many pieces this puzzle has carved. Due to its dimensional hopping concept it is clear the only thing limiting this series is the imagination of Remender and Matteo and Scalera. They have built such a robust world(s) that live by their own rules. Over the last few issues they have been able to give both their take on the general superhero genre while giving us action typically reserved for disaster films. You have hard science fiction melded with the magic of fantasy and somehow it all works.